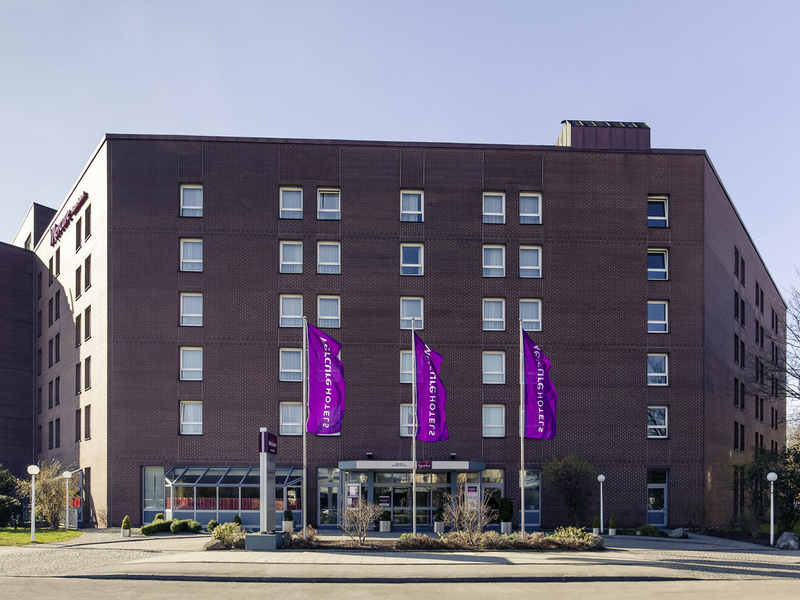 The 4-Star Mercure Hotel Munich Neuperlach South is located close to many high-tech companies such as Siemens, BSH, Atos or Wacker. 253 non-smoking rooms with free Wi-Fi. For your events, you can book 7 meeting rooms for up to 120 attendees. The train is a few steps away from the hotel Neuperlach South. The main station is 8 km away and airport 40 km away. You can travel by car via the A8 or A99. The new Munich district of Neuperlach is located in the southeast of the Bavarian capital and is currently home to approx. 55,000 residents. Numerous high-tech companies and insurance firms are headquartered here, providing around 24,000 jobs. At Mercure Hotel Munich Neuperlach South, you have a choice between standard rooms with queen-size bed, double bed or twin beds, and privilege rooms with queen-size bed or queen-size bed plus sofa. available for guests with reduced mobility. All 253 rooms have free WIFI access. Two children aged up to 12 may stay in your room free of charge. Your pet is also welcome to stay with us (charge of EUR 10/night). Our restaurant "VALENTIN" is open daily from 12 noon to 22:30 p.m. Enjoy our regional and international dishes and make the most of fine weather on our sunny terrace. It may be called the "1516 Bierbar", but the bar at Mercure Hotel München Neuperlach Süd serves cocktails, wine and soft drinks too. Light snacks are also available here on request. The bar is open daily from 6pm to 1am. Room ok but bathroom facilities were poor. Room was ok although I was dissapointed with the shower facilities - Old shower curtain sticking to the bath - I thought I had returned to the 1970`s ! very good comfort. close to public transportation, around 200 meters. large room, good service and fast response. I suggest to include breakfast in your staying as it is fresh and good variety of food, hot and cold. Very low rate in this period. Quiet period. Appreciated the room which was clean and spacious, the availability of the staff and the efficiency for both check-in and check-out. Hope to see the same quality level during my next stays. The staff was friendly and outgoing, but the room was gross: dried blood on the betting and mould growing in the shower and refriderator. The paint was discolored and chipped and I was afraid to touch the carpet. No way this is a 4 star hotel. This hotel was no more than average in quality. It was comfortable enough, but plastic bathrooms, sinks that do not drain properly and waiting staff with an attitude that was not very customer oriented made it somewhere you would stay if you had no other choice. Overall experience is pleasant in terms of check in/out procedure and cleaning service. If supplying minibar can be improved could be better. Sometimes something is missing like water or snacks. The hotel needs dramatic improvement/renovation. the price/service ratio is not any longer at Mercure level, instead it looks more like IBIS. The moquette is so 80s and would benefit from a complete cleaning at least. The parking space is offered at reasonable price and the breakfast variety is ok. This hotel was very quiet , has a good breakfast buffet and very polite and helpful hotel-staff. Check in was easy done online, check out was also fast. Only parking in hotel was quit expensive, but fortunately there were many places to park close to the hotel. Whenever I have anything to do in Munich that requires me staying in an hotel,this hotel is always my first choice simply because of the experiences that I have gathered lodging in the hotel over the years. Easy accessibility to the autobahn,metro and bus stations,free parking spaces around the hotel,spacious quiet clean rooms and a friendly competent staffs at the reception are what I always put into consideration before booking a room at this hotel. There is only one aspect of this hotel that needs serious and urgent improvement and that is the situation in the breakfast hall (restaurant). I always find it difficult to find a table at this hotel whenever I go down to have breakfast simply because the space is too small for the large number of guest attending breakfast.If you eventually find a table,you'll then have to queue up for another roughly 5 minutes just to fill a cup of hot chocolate or cappuccino.No guest in my opinion should have to queue up that long in these modern times and in a four star hotel for that matter just to have a cup cappuccino.The hotel should put in place another coffee machine in the breakfast room as it will cut the time that guest need to wait in order to get a drink. I am a Macedonian Gold Member of LeClub Accorhotels who for the first time met such a vile behavior by a Greek born receptionist who managed to misinform a female colleague and his manager (who was not on-site) when a verbal incident occurred regarding the possibility for early check-in, which in fact was not even so early (1PM). The discussion began with a good afternoon, how are you, continued with the words:...but you know check in is at 15:00, to which I replied:...but not for Gold members. I was expecting to receive a more welcoming answer and acknowledgement of my legitimate request to be able to check-in. It became obvious to me that either the hotel implements a silent policy of not accommodating Gold tier members benefits, or the receptionist himself had a problem with our entry data in the system, indicating Macedonian citizenship. I actually felt it was a combination of both. The argument progressed very rapidly into a higher tone discussion by a guest insisting to know why the room isn't ready when online check-in was made previously and a receptionist who even dared to make judgement about the guest's (me) attitude in front of his wife. I have never experienced such an arrogance by a reception desk staff. To make matters worse, a female colleague who was quickly fed with misinformation by her Greek colleague and only heard my high toned voice which is by nature louder for German standards, threatened she would go to the manager to cancel my reservation. The scandal received epic proportions when the manager (who was not on site) claimed that his staff was insulted by me, but in reality he never invited me and my wife to sit down and ask politely what the problem was. It was clear that he only listens what his staff tells him and has no ear for any legitimate complaints by the guests. The epilogue was: Our reservation got cancelled without any effort to calm down a situation which was initiated and further aggravated by his own staff. Money were refunded as promised (today). However, the bitterness remained, especially because the Mercure and Novotel brands were among the most welcoming to us over the past year with very positive experience as Gold members. This all changed a few days ago. For the first time in my life I felt what is it like to be manipulated, abused, lied to and even hated for no obvious reason. I only asked for a service which the LeClub Accorhotels prides on - Gold member early check in. I was not given, nor welcomed later. Easy to book and check out. Very warm welcome. Room was diapointing: carpet not clean, old comforter on the bed, barroom needs to be refreshed big time. The restaurant for breakfast was packed and the choice was more limited than in the past. Free mini bar make sense life easier. Poor standard for 160,-€. I will try to avoid this hotel in the future. There was a strange smell in the hotel corridors as well as in the room. The bathroom is reminding 80´s, Very limited breakfast menu, over-boiled eggs... 20 minutes long check-in, even I was alone in the front of the desk. Have used Accor hotels often found this one disappointing. Room was in need of refurbishment shower was old fashioned hand sprayer. Hotel not close to many restaurants so eat in both nights which was an average meal on both counts but no atmosphere in the bar and restaurant. Got size of hotel 300 rooms no swimming pool or gymnasium which I would have thought there is a need for . I have been coming regularly (about once each month) for 1 or 2 nights to this hotel. Mostly due to location and completeness of services this has been my hotel of choice. I appreciate many of the services like the free drink and minibar facilities, as well as the excellent restaurant. There are some things that can be improved however: (1) sometimes the corporate rate does not include breakfast and i can understand that, what i do not like is the behavior of the morning staff in those cases, i do understand that i need to pay for breakfast, but they could be much more relaxed about it and make it a much more efficient process. on multiple occasions they explain in a loud (!) voice that i really (!) need to pay. On multiple occasions this has led to delays and line-forming at the restaurant entrance. Why not just give me the invoice and i will leave it signed on the table (i am not trying to cheat you here). (2) after more than 50 visits, the hotel could know by now that i like my pillows to be firm. I know the hotel has different pillows at hand and on several occasions i have come to the front desk to ask for a firmer pillow. (3) no air-conditioning. (4) usually i arrive after 23:00 so i deal with the nigh staff. after spending a full evening in planes and taxi and waiting on airports, they could be a bit more friendly and welcoming. conclusion: i like the hotel, i love coming and it feels familiar; there are points of improvement, especially for the staff and the way they interact with recurring guests. Check in experience needs significant improvement, stay was ok otherwise. Check-in experience was not good. I arrived at 1 PM on an international flight and had to wait beyond 3 PM to get my room. No food or even coffee was available. Restaurant was fully booked for a birthday party. Being Sunday, it was also very hard to find any open restaurants in the neighbourhood. While I understand the constraints (12 noon checkouts, restaurant fully booked) etc., I thought the hotel could have been a bit more sensitive to the needs of customers. At least offer to serve sandwich/coffee while customers are waiting for their room!